Preheat oven to 325 degrees. Grease a 12 cup bundt pan well. Prepare cake batter according box directions. Add the Greek yogurt to the batter and mix until incorporated. Take 1 cup of batter and place it in a small bowl. Add red food coloring to desired color. Set aside. Take 1 cup of batter and place it in a small bowl and color blue. Pour red batter in the bottom of your greased bundt pan. Pour white batter on top. Pour blue batter on top of white batter carefully in a ring. Do not mix batter! Bake according to package directions until a toothpick inserted comes out clean. Remove from oven and cool for 5 minutes then invert pan on cooling rack and cool cake. Once cake has cooled, prepare the frosting. Divide the frosting into 3 separate bowls. Microwave the white frosting for 5-8 seconds or until thinner. Drizzle over cake. Microwave another bowl of frosting and color is blue right before drizzling. Microwave the last bowl of frosting for a couple of seconds and color it red before drizzling. Cover with sprinkles and pop rocks for an extra explosion in your mouth! Who knew a 4th of July dessert could be its own fireworks display filled with color, lights, and explosion? This super fun and eye-catching Firecracker Cake is vibrant and patriotic, just what you need for this 4th of July! 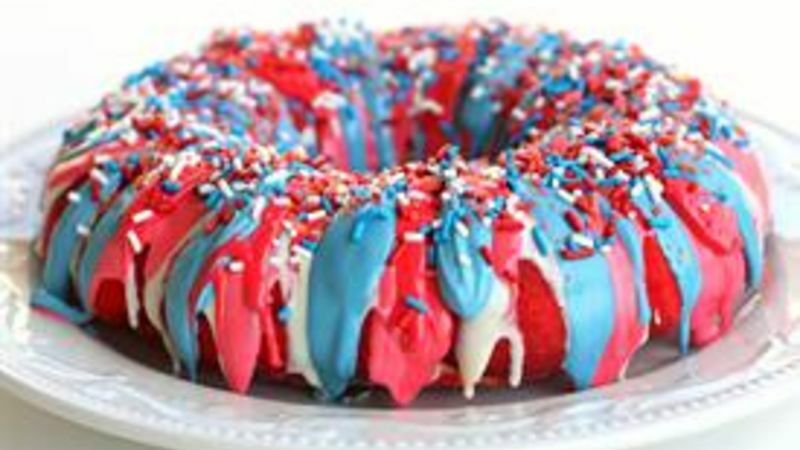 With some creative coloring of a cake mix, the inside of this cake is a shocking surprise of red, white, and blue. When pouring the batter it doesn't have to be perfect, but the more you separate the batter the more distinct the colored designs will be. And who knows what pattern it will actually make until you cut into the cake. There’s no way to screw this up! And just when you thought this cake couldn’t possibly get any cooler, I took it to ONE more level of explosion with sparklers!!! You don’t have to wait until dark to watch these fireworks. Start your fireworks show right after dinner with this Firecracker Cake!